This entry was posted in Pixel Scroll and tagged Bill Higgins, Camestros Felapton, Curiosity, Dublin 2019, Elisabeth Vonarburg, Gary Westfahl, graphic novels, James Bacon, Jerry Pournelle, John Teehan, Kim Stanley Robinson, Larry Niven, Mars Exploration Rovers, Naomi Novik, Science Fiction Outreach, SFWA, Shaun Tan, Steven H. Silver, Worldcon 76 by Mike Glyer. Bookmark the permalink. If a rover sings on Mars and no one hears it, has it really made a sound? 3- As far as SFF Netflix things go, Extinction is a pretty good SFF movie with some fairly mediocre special effects. (13) excellent review, in both senses. 1) I can attest to the brilliance of ‘The Arrival’. And the rest of Shaun Tan’s work too. ‘The Lost Thing’ won an Academy Award a few years back. Currently marooned in the City of Baldes with Turyin Mulagesh, but falling asleep before being able to progress too much. Baltic states proving too much of a distraction. We, in that man Glyer’s Employ, Scroll in a Pixellated File. I saw a trailer for The Darkest Minds and thought that it was The New Mutants which also apparently has a film due. We watched this last night and enjoyed it. Helps that it has a decent cast. (9) Doesn’t that “several months past” (see screenshot) mean that August 5 is not Bill’s birthday, in this or any other year? @bookworm1398: let me answer your question with another question. If a filer filks on Mars and Mike isn’t there to scroll it, have they really filked? I mean: there’s nothing “cold and unfeeling” about saying “We did that once and it was beautiful, but we also have so much incredible research and exploration to do, and every iota of energy that Curiousity expends is tremendously valuable.” That’s not cold. That’s awesome. 14)….Well, that was a pointlessly lengthy diatribe about the horrors of YA science fiction. Please, tell us how you really feel. The Jo Walton book AN INFORMAL HISTORY OF THE HUGOS is due to be released tomorrow. I ordered it after reading about it here, about two years ago. and they won’t let me hum Happy Birthday no more. * Work of fiction. Nothing can stop Opportunity. Nothing. Not even the recently discovered Martian lakes. Niall McAuley, Jack Lint, applause! Niall McAuley, Jack Lint, when I raise a Guinness or two later this afternoon, it’ll be in your honor. (1) I’m moderately well-read in comic books and graphic novels, but I’ve only read three of the suggested books. THE ARRIVAL is amazing and well worth getting – I checked it out from the library and immediately bought a copy after reading it. I force it on guests who stay for more than a day, and every one of them has liked it as well. MAUS is just one of those books that you’ve read if you want to understand the power and range of comic book form. The subject matter is painful, even with the distancing using animals as fill-ins for humans. Also well worth reading. PERSEPOLIS is a very good look into a life I wouldn’t have thought of looking at. The form makes her easy to follow and relate to, and again, I think the first volume is very much worth finding and reading. I felt the second volume was a bit of a let-down, but I never was able to put my finger on why. (9) The keen-eyed Rev. Bob is correct: my birthday, one I am proud to share with such prominent fen as Seth Breidbart and Paula Lieberman, falls on 12 January, not 5 August. Sorry if I conveyed an incorrect impression. 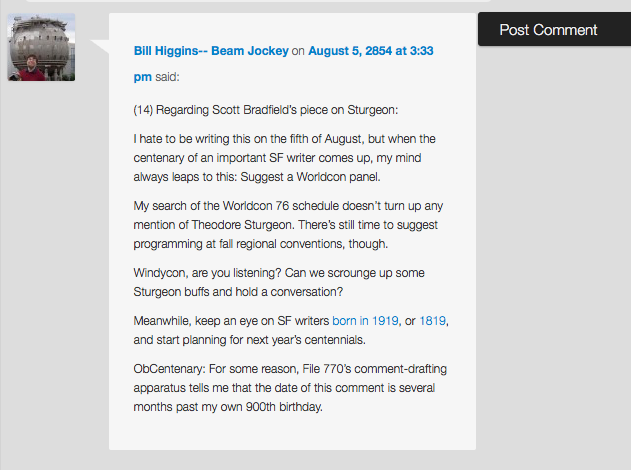 Nevertheless, 2854 is the year my triplets Seth and Paula and I will turn 900, so, in the context of discussing centennials of Theodore Sturgeon and others, I thought that nonacentennial worth noting. I was an adult before I figured that out. It took Sandman, with art that was actually worth looking at even if there hadn’t been a story around it, for me to realize that a big chunk of the story was not made out of text. I was reading before I can remember, so grade school comic and picture books just seemed like a total waste of time. Binti fans might like to see the picture of a Himba lady with fantastic hair and Otjize in one of the BBC’s recent photo roundups. Meredith, great link. I always enjoy the BBC’s picture roundups,and that particular photo did help fill in visual background for the story. I didn’t understand or remember from the story about it being a protection from the sun, but that makes a lot of sense. I managed to finish reading most Hugo fiction categories just in time for last week’s voting deadline, except for Novelettes. What does that prove? Well, I don’t know. I’m moderately well-read in comic books and graphic novels, but I’ve only read three of the suggested books. I’ve only read four, myself. But Paul Gravett usually knows his stuff. And one of the ones I’ve read that you haven’t — TAMARA DREWE — is, to my mind, a masterpiece. It plays with both visual and narrative approach without ever sacrificing readability — possibly because the author, Posy Simmonds, is a longtime newspaper comics creator, reaching a mass audience rather than an enthusiast audience, and clarity is crucial for the kind of comics she’s done. I’ve also read THE WALKING MAN, which was a wonderful visual experience, but much as I can appreciate it on a craft level, I’m more drawn to comics that use text and art in combination. So, considering that the three I’ve read I’ve enjoyed (and are, in fact, high I my own list of recommendations) I suppose I ought to go seek out the others. One of them (the one listed as “The Walking Man”) is available here. @David Goldfarb – Probably also some correlation between visual and non-visual thinkers. I was also an adult before I figured out that “picture it” was more than a figure of speech. I’m still not sure how the whole “make pictures in your head” thing is supposed to work. microtherion: It’s 106 miles to Chicago, we’ve got a full tank of gas, half a pack of cigarettes, it’s dark, and we’re wearing otjize. Hit it! @Jamoche: Perhaps. My own thinking style is primarily auditory, but I can picture things if I need to. Andrew M : from the Goon Show, and their parody of QUATERMASS AND THE PIT. The Scarlet Capsule. 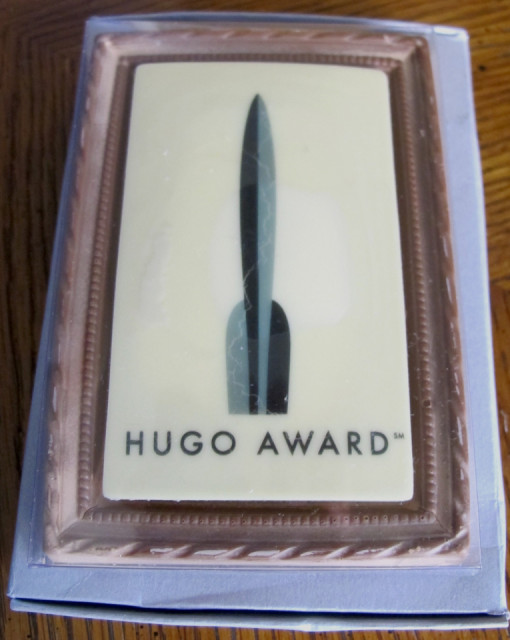 #11: Chocolate Hugo: I have a piece of the chocolate Hugo that was created for Science Fiction Age, the late SF magazine edited by Scott Edelman, for the 1993 (I believe) Worldcon. He saw a Hugo-shaped piece of chocolate, but unfortunately fans just saw chocolate. And they consumed much of it. The pointy part is what I saved, and I have it here still. Every few years I was the dust off, but eating 25-year-old chocolate is tempting the digestive gods.